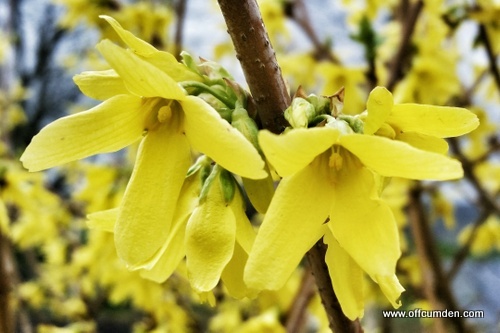 I took this picture on Monday, the Forsythia blossom looking absolutely stunning at this time of year. It made me think of my grandma, who always used to enter it in the spring horticultural show. The garden is blooming at the moment. The daffodils and tulips are out in force and there are splashes of purples, greens and pinks about too. It makes me realise just how much work there is to do out in the garden and I don't envy my task. My grandma would spend all day every day outdoors gardening, and I just don't have the time! I have, however, planted around sixty seeds as the start of the vegetable patch takes shape! I may well make a gardener of me yet! Spring is one of my absolute favourite seasons. I love the hope, the promise of new life. Both my children were spring babies and I have fond memories of the lighter, warmer days and many walks with the pram. Now we no longer have a pram, and it's the children who do the walking. Last week we went on a seven mile hike together and their little legs did very well!